leximation.com >> samples >> airhelp questions? "AIR Help" is a term that refers to any user assistance application developed using Adobe's AIRTM (Adobe Integrated Runtime) development technology. This is not an official Adobe term. It is a term (coined by Scott Prentice in 2007) that refers to any type of user assistance (or Help) application developed using Adobe AIR. AIR Help Primer - Detailed information about AIR and AIR Help. AIR Help Development 101: Install and Test the AIR SDK - Walks you through the process of installing the AIR and Flex SDKs, then provides some sample AIR code for developing a very basic custom AIR Help application. The Adobe AIR development platform lets you deploy cross-platform, rich Internet applications on the desktop. This means that you should be able to take your existing "web help" files, and wrap them up in an AIR application that can be installed as a Help system. The same AIR application can be installed on Windows, Mac, and Linux systems. AIR Help Wordle - Just for fun! There are two commercially available tools that allow you to export Help as an AIR application (aka "AIR Help"), Adobe's RoboHelp 8 and MadCap Software's Flare 6. Adobe also offers a utility called RoboHelp Packager for Adobe AIR which lets you generate an AIR Help file from a RoboHelp WebHelp project (for use with RoboHelp 6 or 7). All of these options result in an AIR-based cross-platform Help system without needing to develop and manage the underlying ActionScript code yourself. Definitely worth looking into! If you are using RoboHelp 8, check out the following eLearning session from RJ J�cquez of Adobe, titled "Building Web 2.0 User Assistance with Adobe AIR and RoboHelp 8." It's a little long, but does provide all of the info you'll need to produce AIR Help from RoboHelp 8. If you want to create your own custom AIR Help system, you'll need to do some coding and design work. This can be done using the Flex development environment as well as others (one promising IDE is called Aptana Studio .. www.aptana.com/studio). You can also do this coding outside of an IDE and use the command-line compiler to build your AIR project. Using the AIR and Flex SDKs (both free), you can build AIR applications as part of an automated publishing pipeline. The sample files below are provided as a very basic proof of concept. There are a number of things that need to be worked out before this can be a truly viable online Help alternative, but as this gets more focus, I'm sure many people will come up with some nice options. The ability for an external application to "push" a search query and display the results. Options dialog to set the following: Remote loading of search index on startup; Check for user comments on each topic; Keep help on top. 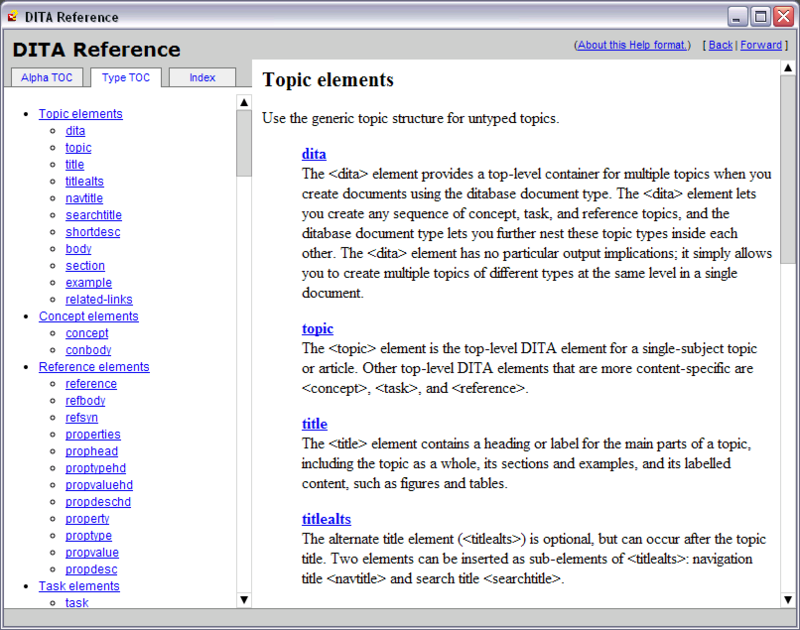 "Next" and "Previous" browsing through topics based on the TOC ordering. 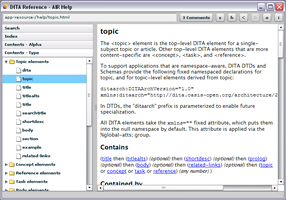 We are working on a DITA to AIR Help plugin for use with the DITA Open Toolkit (OT 1.5). Once this is working well we will make it publicly available for download. Until then, if you are using DITA and are interested in beta testing this plugin, feel free to contact us. 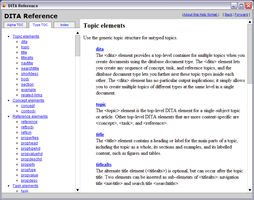 air-pdf.0.01.air [640KB] - A simple 2-topic file that includes an embedded PDF. 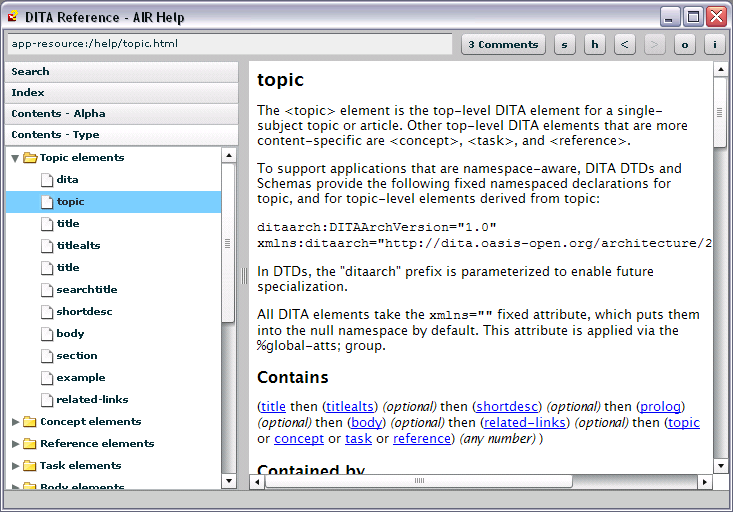 ditafmx.1.1.01.02.air [3127KB] - The current (beta) online Help for DITA-FMx 1.1. This version implements the "check for updates" feature. It is also now digitally signed, so you'll need to manually uninstall the previous version (using Control Panel: Add-Remove Programs), if you installed the previous beta. After installing, click the "version" button to check for updates. As people develop their own implementations of AIR Help, I'll collect samples for others to see. Feel free to send in yours (use the contact page). I've started a Yahoo group ("AIR_Help") for anyone interested in talking about these issues and sharing Help-related ideas for this new development environment. After installing the runtime, you can download and install the AIR application. To install the application, double-click the AIR file after downloading. You'll get an installation dialog that tells you the publisher is unverified and the system access is unrestricted (I believe that later versions of AIR will allow digital signing and a restricted system access option for a more friendly install. The source is provided for those interested.) You can choose to install or cancel. If you choose to install, you'll be prompted for the location to install as well as other options. Download Prototype Four - This is the current version .. sorry no source available for this one yet. Download Prototype Three - This is an early version of the "second" prototype shown above (source included). Download Prototype One - Looks like the "first" prototype described above. Download AIR Help "Basic" - Instructions and sample files for making a basic "wrapped" AIR Help file.